Engineering Tech Day is an exciting and engaging experience for your young innovator. Fun, imaginative sessions including activities in robotics, electronics, construction, manufacturing, and engineering await your camper. Don't miss out on one of the area's most popular summer programs. Register Now! Space is Limited! Explore bridge design using the latest in computer simulations, then put your ideas to the test in a bridge building contest. Aspiring Engineers will learn some basic principles that inform bridge design, explore possibilities in the computer simulation, then build their own bridge to see their ideas become reality. This activity will culminate in a bridge-breaking contest to see whose idea was the strongest. Take a peek inside the mysterious world of coding, and the hardware that makes it work. This activity will allow participants to not only experience code creation, but also explore the technology behind it. Campers will set up a breadboard and learn how specific functions can be enabled. This will build to an activity in which they program an electric car! Additionally, campers will also set up their own web server and database. Design your robot to be the best at our camp robotics challenge. Design and build wearables that utilize and integrate the latest technology . Use unexpected materials to build your wearable —take it home and make a statement. Unleash your creativity to express your own unique style. If you participated in last year’s STEM CAMP, or are looking to add another day to your camp experience. Make It Take 2 and Robot Resurgence will further explore the concepts from Make It Take and Robot Revolution. What’s better than building one multi-material take home project? Building a second one! Explore new materials and processes and expand your skills. Robot Resurgence take your Robot past the revolution. Campers build on experience to overcome challenges of increased complexity and difficulty. Day will consist of two three hours sessions of activities. Students will pick two out of the four activities for the day. The day will begin at 9:00 for the first session. Lunch will be provided at 12:00 and last till 12:30. Second session will begin at 12:30 and the day will concluded at 3:30. Participates will be receive a t-shirt and lunch. If students are interested in more then two events they may sign up for additional days. Pick your day of participation. 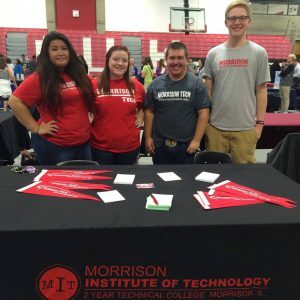 Submit the application through mail, fax or email to Morrison Tech - STEM Day 701 Portland Ave, Morrison, Il 61270 , fax to 815-772-7584, or email to admissions@morrisontech.edu.